Mexican salsa verde (“green sauce”), which is often more mild than its red counterpart, gets its brilliant color from fresh green herbs such as parsley, chives, and oregano. It’s also a great complement to chicken, fish, and beef. Cut down prep time with our guide to cleaning and trimming artichokes. You can also serve the main-dish salmon without the grilled artichokes—the fish and collards are delicious on their own. Recipe courtesy of Mary Sue Miliken. Recipe adapted from Moveable Feast with Fine Cooking. Snap off the dark-green outer leaves of one of the artichokes until only the pale, tender inner leaves remain. Cut off the top third of the artichoke and all but 1/2 inch of the stem. Using a paring knife, peel away the tough outer layer of the stem and remove the base of the leaves all around. Repeat with the remaining artichokes. Squeeze the lemon halves into a large bowl of cold water and soak the artichokes for about 10 minutes to loosen any sand or grit. Drain and rinse the artichokes with cold water to remove any remaining sand. Put 1 inch of water in a pot wide enough to hold all the artichokes in a single layer. Set a steamer rack in the pot; it should rest just above the water, not touching it. Bring the water to a simmer over medium heat. Arrange the artichokes, stem end up, in the steamer. Cover the pot and adjust the heat so the water is at a simmer and the artichokes steam steadily. Cook until a knife pierces the bottoms easily, 30 to 45 minutes, depending on size. (Check occasionally to be sure the water hasn’t boiled away.) Drain, stem end up, on several layers of paper towel until completely cool. Meanwhile, add the parsley, chives, and oregano to a food processor and pulse until finely chopped. Add the anchovies, garlic, paprika, and crushed red pepper and pulse to combine. With the motor running add the oil, vinegar, and lemon juice. Season to taste with salt and pepper. Let the salsa verde sit for at least 30 minutes for the flavors to meld. Halve the artichokes lengthwise. Using your fingers, remove the purple center leaves and using a small spoon, scoop out the hairy chokes. Halve lengthwise again. Heat a gas or charcoal grill to medium (350°F to 375°F). Lay a large piece of aluminum foil directly on the grill and brush with oil. 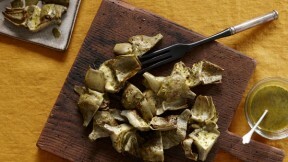 Brush the artichokes on all sides with the salsa verde. Cook until grill marks form and the artichokes are heated through, about 5 minutes. Serve immediately with the remaining salsa verde.